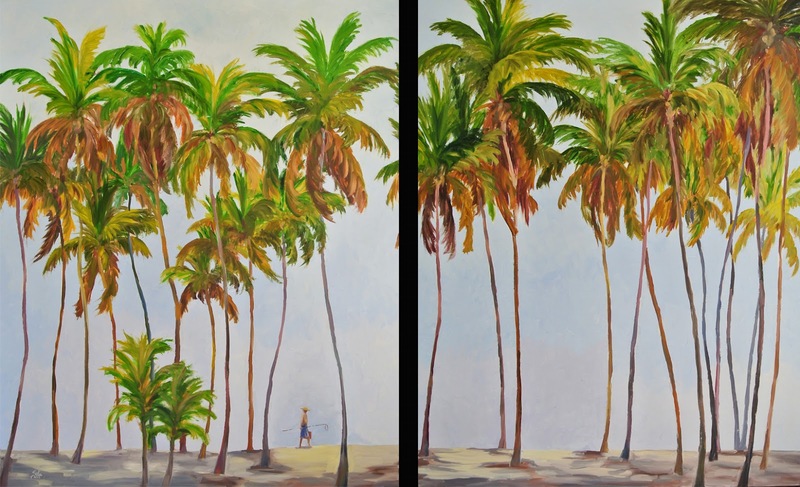 Artist's Comments: I was recently contacted by one of my collectors to help her stage her condominium for a quick sale. She was working with a budget to rennovate the property and asked me to paint 3 large pieces to complete her project. I was excited to help with this project largely due to the fact that I felt my paintings would be a stunning compliment to her existing decor. I worked with her color pallet and custom painted this piece to hand on a long wall in her entertainment room. A television sits between the two pieces so I needed a simple compision that wouldn't be distracting while watching tv. I selected this scene due to its simplicity, bright colors and because it brought the feeling that you were walking on the beach. In addition, we were concerned that the room was a little dark so we selected bright colors to lighten the walls. 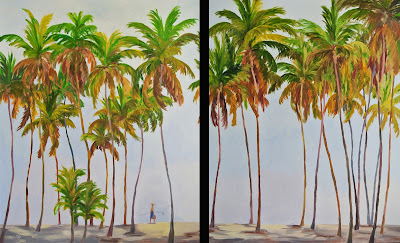 A large grove of Eureka palms is set just outside of the pocket doors to this area so when the doors are open, there is a nice transition between the palm trees of this painting and the palms outside.